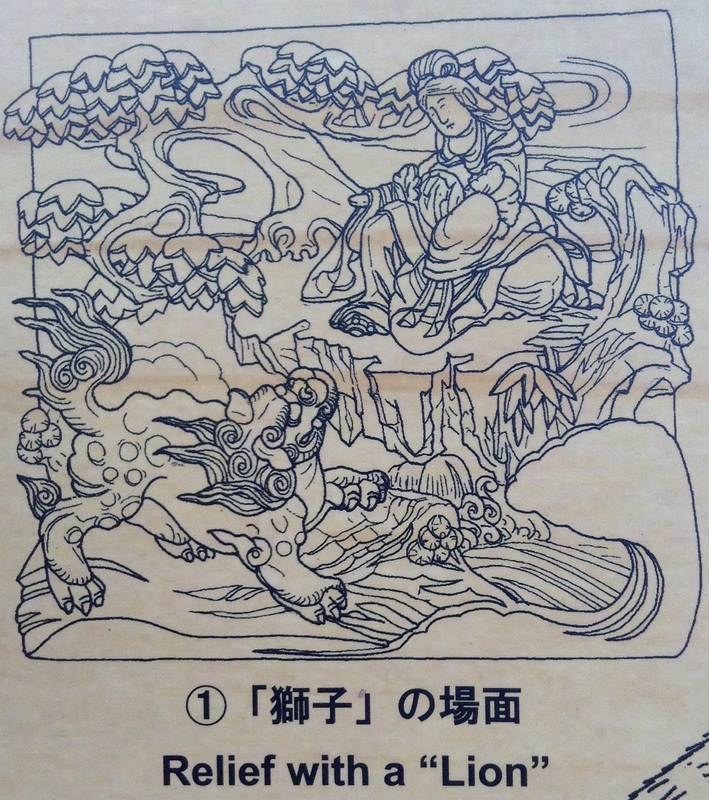 The first version of the legend of the silkworm princess comes from Sanrei-jinja or Sanrei Shrine in Kamisu city, Ibaragi prefecture. 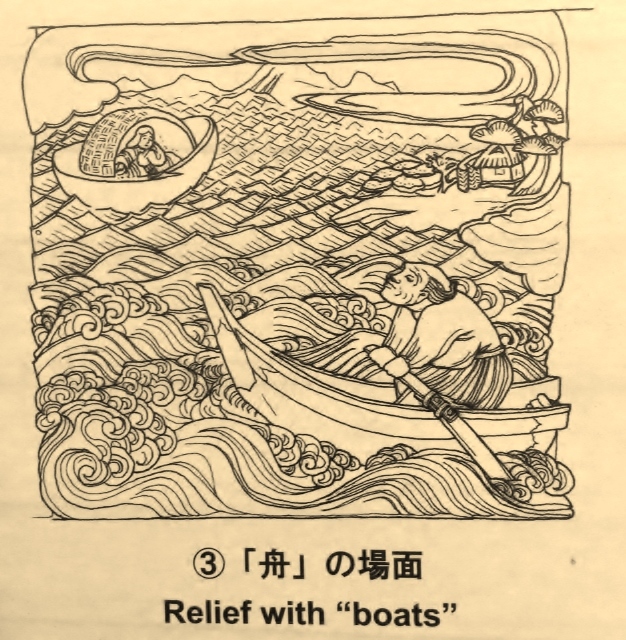 As Sanrei Shrine 蚕霊神社（さんれい　じんじゃ)’s tradition goes, in the month of March 286 BC, a fisherman by the name of Gondayu found a small timbered boat drifting on to shore and he dragged it up the sands of the Toyoura Beach (豊浦浜 currently known as Nikkawa Beach which is about 2 km from the Sanrei Shrine). When he had had a chance to examine the boat, he discovered inside it was a beautiful girl, who turned out to be a princess from India. The princess had a tragic tale to tell – when her mother passed on, her father remarried. But like most classic evil-stepmother-fairytales, the princess’ new stepmother hated the princess because she was very beautiful and devised a plot to have her taken out to a remote island and abandoned on a mountain where wild lions were known to roam, and where fierce hawks nested. 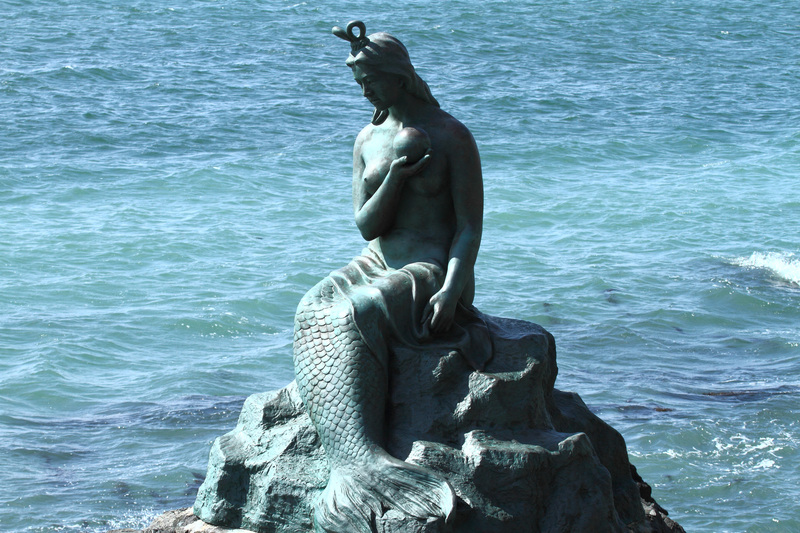 But as fate intervened, the princess was rescued by lions, hawks, and fishermen who returned her to the palace. Then the wicked stepmother in exasperation, had the princess buried her underground. But once again, the stepmother’s plan was foiled, as the princess was delivered by some supernatural presence and dazzling light that shone out of the ground and once again, the princess returned home. Finally, the step mother confined the princess she hated with a passion in a timber boat made of wood from the mulberry tree and set it adrift on the ocean. The boat eventually drifted to Toyoura Beach and was taken up onto shore by the good fisherman, Gondayu. Gondayu tried to nurse the princess back to health but she died anyway due to exposure and disease and was transformed into small insect. Gondayu believed that the insect was the princess reborn and incarnated as an insect and he fed it leaves from the mulberry tree. Then the insect began to spit out beautiful thread, and making a cocoon, confined itself in it. Gondayu then used the thread of the cocoon to weave fabric. That is how the sericulture in the area began and eventually the sericulture industry made the village prosperous. 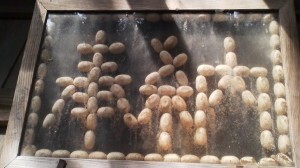 A shrine was built by the locals to show gratitude and respect towards the originators and creators of sericulture…. This second version of the Golden Princess tale comes from the Kokegesan shrine formerly on the precincts of the Tokoin Temple, in Asao ward, Kawasaki city, Kanagawa, now relocated to the Japan Open Air Folkhouse Museum in Kawasaki city. As this version goes, the Golden Princess was born in northern India, and after overcoming four hardships, she arrived in Japan, as an incarnation of the Boddhisatva Memyō Bosatsu, introducing to local people the new technology of sericulture. It is said that the four hardships symbolize the four dormant stages in the life of a silk worm before it pupates. 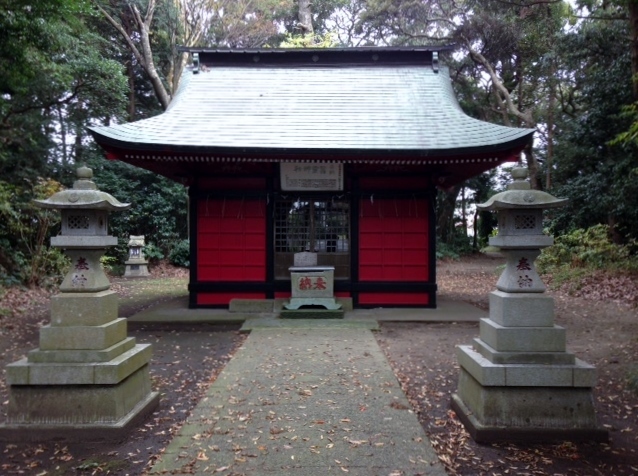 The small but elegant shrine is dedicated to the patron deity of sericulture, Kokegesan Daigongen. Originally located in Okagami (In the precincts of Tōkōin-Temple), Asao Ward, Kawasaki city, Kanagawa prefecture. But as the silk industry declined, it became difficult for the village people to afford the cost of maintenance, so the building was moved to Nihon Minkaen open air folkhouse museum. The shrine is decorated with relief carvings (see above and shown redrawn and enlarged below) depicting the story of the Golden Princess, although they are not fully open to the view of visitors. 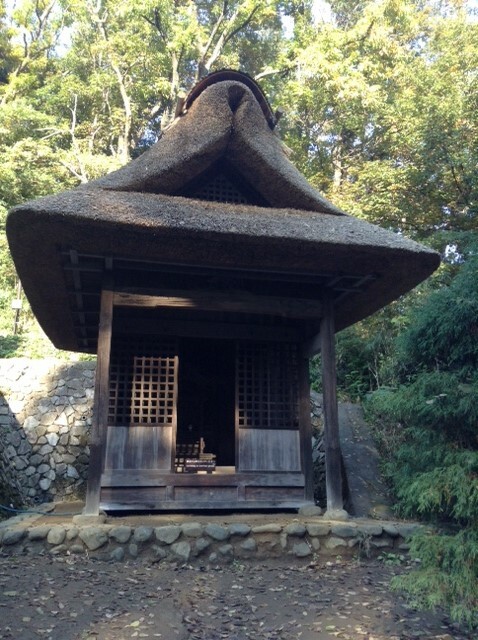 This is a small shrine (kūden) is contained within a covered thatched building to protect it from wind and rain. It used to be located in the precincts of Tōkōin, a local Buddhist temple, and was an object of veneration for years. 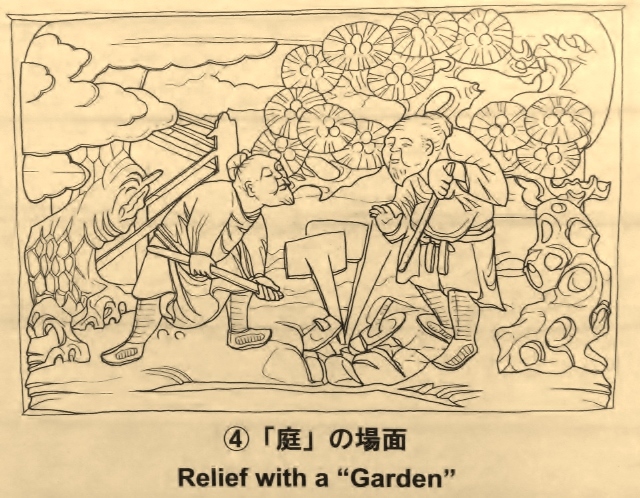 This folktale account is obviously a later version that has undergone syncretism incorporating a Buddhist deity Boddhisatva Memyō Bosatsu. With a half hipped roof at the front and a hipped roof at the rear, the covering building is a cusped gable entry structure a cusped gable (Ikkensha, Kasugazukuri, mukai-karahafu, kokera buki) designed to be as impressive as possible when viewed from the front. Although relatively small, its roof makes it look magnificent, with deep eaves supported by long jettied members on all four sides (Segai Zukuri). The grass ridge (shibamune) of the thatched roof has irises planted in it, which look beautiful when they bloom in the spring. The space at the front of the building is an open earth-floored area, conceived as a kōhai(the porch area provided for the use of worshippers at the front of a temple building). The shrine (kūden) is set in the innermost recesses of the floored part of the covering building, surrounded by sliding panels and walls. 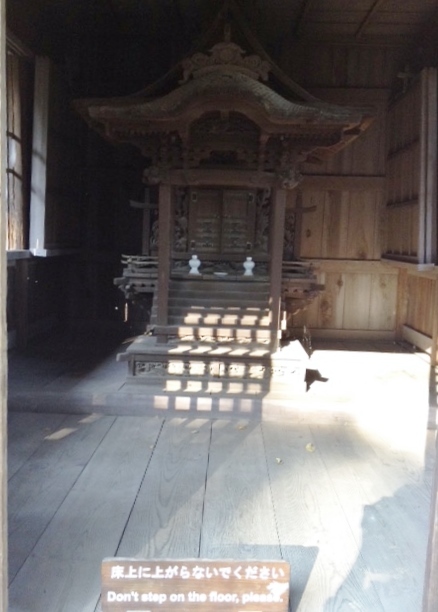 The inner part of wooden floor, where the kūdenstands, is elevated, emphasising the respect in which the shrine is held. 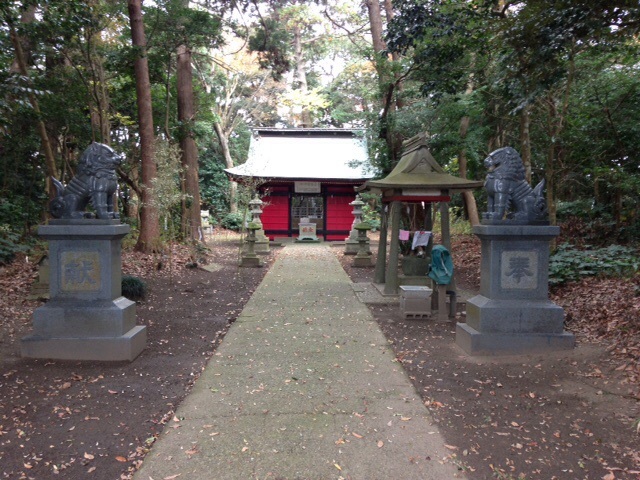 The shrine is of the Kasuga Style type (i.e. it is modeled on the gable-entry shrine buildings of Kasuga Taisha in Nara) with a karahafu (cusped) gable at the front. 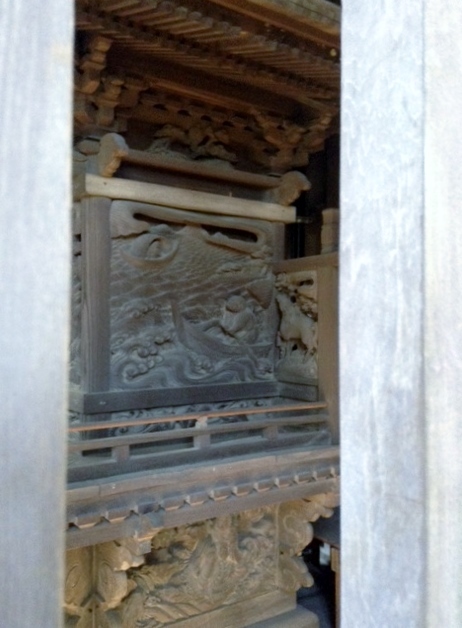 It is known from the munafuda nailed to the rear wall of the building that the shrine was built in 1863. 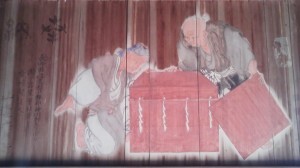 The next version of the tale is recounted in TsukuBlog’s article “Ancient ritual for silkworms at Kokage-san jinja” in which the existence of another Kokai-jinja in Hitachi (Ibaraki prefecture) is mentioned, and detailed descriptions are also given of another Silkworm-deity dedicated Kokage-jinja in Tsukuba, also in Ibaraki (excerpted below), which according to the article, is supposed to be the oldest shrine in Japan dedicated to the Kokage-San Silkworm deity, although as I posted above, the shrine tradition of the Kamisu shrine, if accurate, makes that one the oldest. “Kokage-San Shrine is yet another Tsukuba superlative. It is the oldest shrine in Japan dedicated exclusively to sericulture and once attracted thousands of worshipers, many from the textile towns of Nagano, Gunma and Yamanashi. Located in the beautifully rustic Kangori (神郡) district of Tsukuba, the shrine is reached by ascending ancient and uneven stone steps through an even more ancient sacred grove. The sea used to actually reach　not very far from this site, and according to local legend (there are several versions! ), in 6th century India there a princess who was constantly being abused by her step-mother. The situation got worse and worse and finally, the king decided that it would be best for his daughter to make her way to another land for a new start. He had her put in a boat made of mulberry wood and had her cast off. She made landfall near Mt Tsukuba. A local man called KONDAYU and his wife tried to help the princess- but to no avail. Starved and exhausted, she shrivelled up into a little worm, The couple put it in a big box and fed it mulberry leaves. It grew bigger and stronger. It made a coccoon. The deity of Mt.Tsukuba, in the form of a hermit named EIDO SENNIN (影道仙人), taught the local people how to extract silk thread from the cocoon. This was the beginning of what would become the thriving sericulture of this area. To the right of the shrines main hall, under an enclosure I found an undated E-ma painting, donated by someone from Nagano Prefecture, depicting this scene. I had a chance to chat with the Kanshushis (Shinto priests) as they were setting up the offerings on the altar. They were actually sent by The Tsukuba-San Shrine, as the Kokage Shrine has nearly been forgotten with the peicipitous decline in sericulture in Japan over the past few decades. Now there are priests at the shrine only twice a year, March 28th for the spring offerings, and then November 23rd for the shrine’s festival. They explained to me how special the silkworms (kaiko) were to the Japanese, as they were the only domestic animal actually raised in people’s homes. 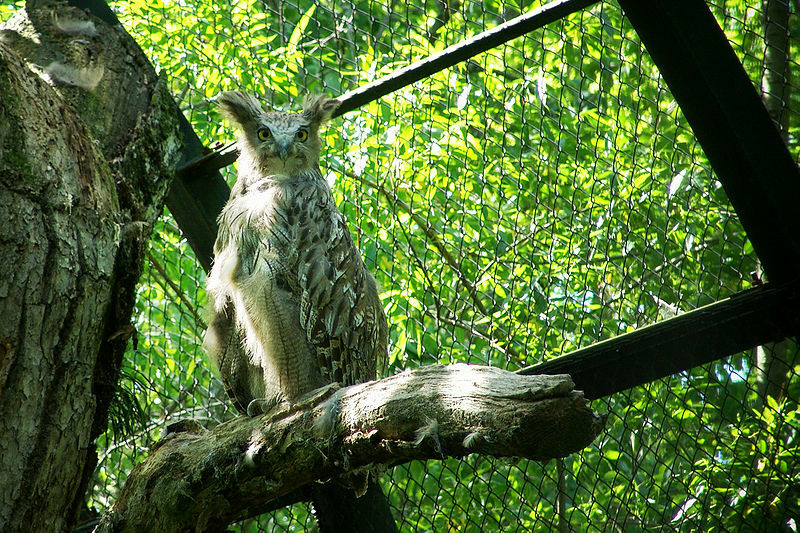 They are also the only animals which normally are referred to using an honorific – O Kaiko-Sama, though the local people usual shorten this to O Ko-Sama. As the time came to commence the ceremony only three old men had battled the stairs and settled inside the shrine for the ceremony. This being a mere shadow of the crowds which would have been there in former days. 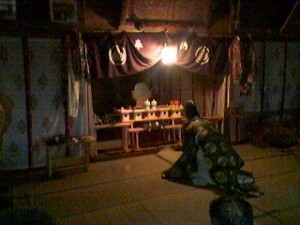 First, a purification rite was carried out, and then offerings of cocoons, fruit, and sacred sakaki leaves were made. O-miki (sake) was then drunk, and commemorative towels given to the few of us present. After the ceremony, we clambered down the steps as the local men reminisced about the shrines glory days. Now the wooden buildings which would have been used by numerous vendors on this day were virtually falling apart ( one has actually collapsed!). One man mentioned that a movie had been shot on this staircase, though he could not recall the title ( it was the unwatchable first directorial effort by actor Yakusho Koji- Gama no Abura). Another man mentioned how just the other day the Emperor and Emperess performed a similar ritual for silkworms, which he had seen broadcast on TV (the Imperial Couple raises rice and silkworms for ritual purposes). 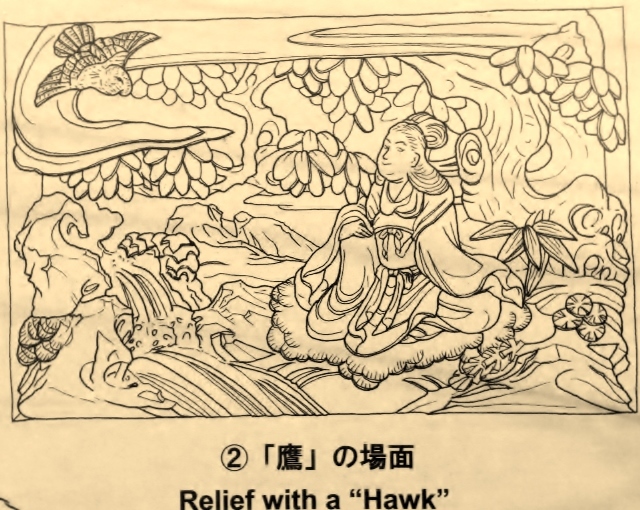 these accounts are completely different from the continental Hata clan and other Chinese or Korean-provenanced myths, the details of the different myths can reveal the specific connections with migrant populations from outside of Japan. For further reading on this subject, see Weaving goddesses of Japan and elsewhere in the world; A loom with a view. Michael Como’s “Weaving and Binding: Immigrant Gods and Female Immortals in Ancient Japan” and Akima Toshio’s “The Myth of the Goddess of the Undersea World and the Tale of Empress Jingu’s Subjugation of Silla” (Japanese Journal of Religious Studies 1993 20/2-3) both works mention the important connection between the divine descent and weaving maidens such as Amaterasu’s younger sister and sacred weaving maiden Wakaru-hime who fell on her loom and died; Himegoso‘s vengeful Akaruhime ; Natsuhata-hime and Kamuhata-hime, and the miniature loom/shuttle offerings that were made in prehistoric times to the Munakata goddesses on Okinoshima.